March 29- I will be presenting at this event! 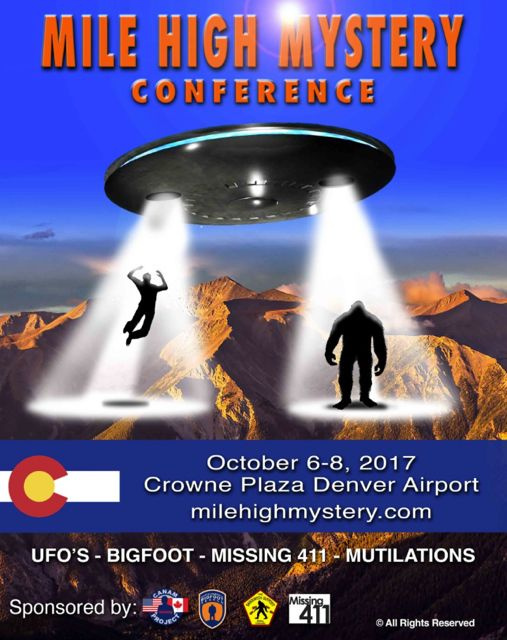 There is a stellar lineup of great speakers on bigfoot-UFO's and Missing people. I hope to see you there! 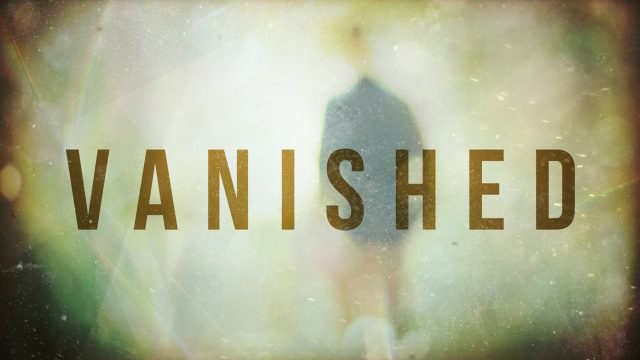 January 3- Watch our two hour special about missing people that will air this Saturday night on the History Channel, titled, Vanished. The show is based off the missing 411 books. David Paulides has released his first Bigfoot book in nine years. I just got notified that the venue tomorrow for my presentation has changed, new location listed below, 1-4pm. 6/18-- Our online store is OPEN!!!! 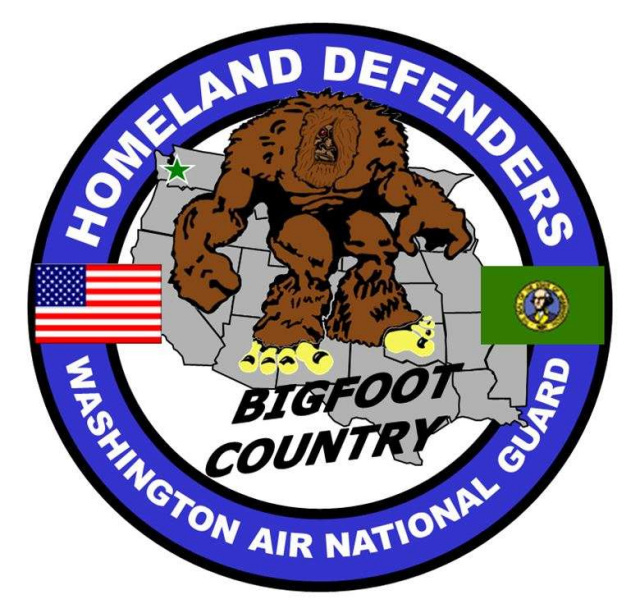 2/17- A pretty interesting logo from the Washington Air National Guard!! 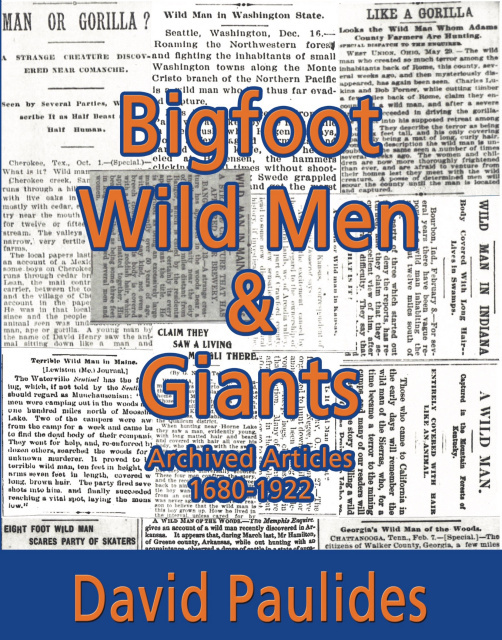 12/27- For the first time in almost a year, we have two of the best reviewed and best selling bigfoot books in the world in stock, The Hoopa Project and Tribal Bigfoot, in our store now!! 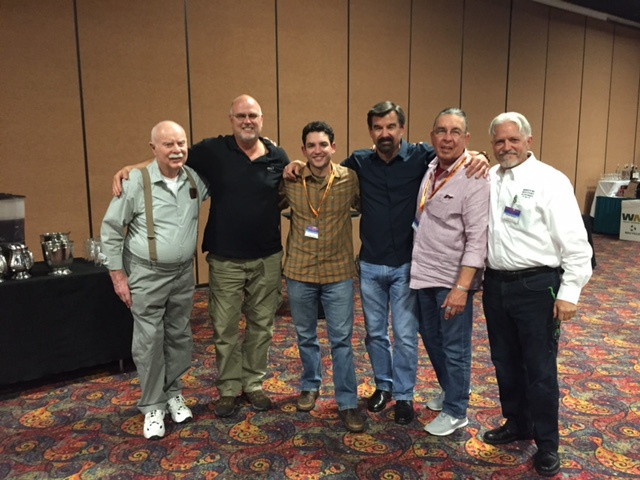 10/6- The entire team together at the Mile High Mystery Conference in Denver. Scott Watts Recd my blu ray copy today , Great Job on the Movie !!!! I could have easily watched a 4hr movie on this ..... even longer . As sad as these stories are they are interesting as hell . Great Job !!! Well worth the wait! As a fan who hasn't read all the books, but have listened to many of Dave's interviews. This approach was broad enough to not take you down the path of paranormal, or conspiracy theory, but sheds light on truly bizarre missing persons cases. It doesn't draw any conclusions for causes, but presents many points of view from all parties involved. Very well done visually as well. Production value is great, considering how inexpensive (in the grand scheme of film making) this film was to make. With the staggering amount of cases there are, I definitely think a follow up is warranted. Maybe then, the paranormal aspect can be touched on, but glad that it wasn't overblown. Roxy Lopez Missing 411: The Movie Thanks for making the movie! I know how hard it is to put all the parts together into a 1.5 hour informational piece! GOOD JOB!!!!!!!!!!! We look forward to more of your films! YEARS of research! That wasn't easy! Got my DVD today and just finished watching it. It was profoundingly moving and disturbing. I saw my 3 year old great grandson in every little face in this film and it just stabbed me in the heart. I can only imagine the fear, pain and sense of loss these parents are feeling. Its not something that could ever go away. Thank you for this film. Very well done. I hope it gets seen world wide and I pray that we get answers soon. Excellent production...for such sad, strange stories. I just wanted to send you a note and tell you how much I enjoyed the premiere. I thought the movie did such a beautiful job of humanizing the subject and showing the real impact two families who have lost people. I am largely a statistical analytical guy which is why I love your research and the Bigfoot subject in general but it's easy to forget that within all of that data the lives of real people are impacted. First thanks for the prompt delivery of the video. I must say that the coverage of the affected families was first rate. You always wish that you could do more when you get into very stressful situations. Having managed a cemetery in the town I lived in for 15 years I have a little first hand experience. In addition you did not overplay the issue of the possible causes of these disappearances, but instead let the families start to bridge that gap. Anyway excellent work guys. If you decide to make a follow up movie picking more controversial cases should bring home the point that something is going on out there. Got my Kickstarter package last weekend for the long anticipated "Missing 411" movie and couldn't wait to watch the DVD. Wow...I was very impressed!!! I had heard that the film would feature the Deorr Kunz case in Idaho...the toddler who disappeared in July 2015...but I didn't expect that this sad tale would be its main focus. Very moving and heart breaking. Author and researcher David Paulides, whose "Missing 411" books were the inspiration for the film, has certainly brought to the viewing public a real gem...a work that everybody who enjoys spending time in the outdoors with their families should see. 3/12- We encourage supporters to purchase the April 2017 edition of Outside Magazine. There is an extensive article about people who have disappeared in the wilderness and a significant section on the work of David Paulides and missing people. The article is not online. 1/13-Many of you know that I have a close working relationship with Mossy Oak. We have worked on projects in the past and will have something very interesting in support of Missing 411 in the future. The people at Mossy Oak are extremely supportive of law enforcement and go to great lengths to help them at a time of need, this is a GREAT example of the type of people they are. It was almost ten years ago that I first heard of Ray Crowe, bigfoot researcher from Hillsboro, Oregon. Ray’s work caught my attention because he had an open mind and a great way of documenting the information in his monthly newsletter, The Track Record. Ray lived in Northern Oregon and had a history of diabetes. The first time I met him face to face is after he had posted his research for sale, I bought it. I saw the value in everything the man did. His track Record was a compilation of bigfoot, UFO stories, reptilian encounters, you name it, the Track Record had it. I drove to Oregon to hand him a check and pickup the property. He was a VERY nice man that listened well and didn’t discount people’s theories. His favorite saying, “Keep your spectacles on,” meaning, read it all and don’t necessarily believe everything. Ray and I communicated much more after I purchased his research. I think that he initially thought that after he sold his stuff, he’d be out of the bigfoot world and seemingly go into retirement, not quite. In 2012 he called and asked if he could write a book and include material from the Track Record that I now owned. I said an absolute “YES.” He published, Bigfoot Behavior-1. It is a very good book that talks about different aspects of the biped’s behavior. In September of this year Ray released Bigfoot Behavior-2 and 3 and a revised version of #1. In my time in the bigfoot world I soon realized there weren’t enough Ray Crowe’s. He was polite, reasonable and never demeaned others. Tonight I was deeply saddened to hear that Ray passed on from complications related to his diabetes. Our world lost a good man tonight. I will miss him. 7/6-This is the latest review of "Missing 411-Western United States" that was posted on Amazon.com. We think it's important as its from emergency management personnel. 3/14- George Knapp has just announced that David Paulides will be on his Coast to Coast Program on March 17 for three hours discussing his "Missing 411" books. David has stated that there will be a major announcement during the show!! Mark your calendars!! 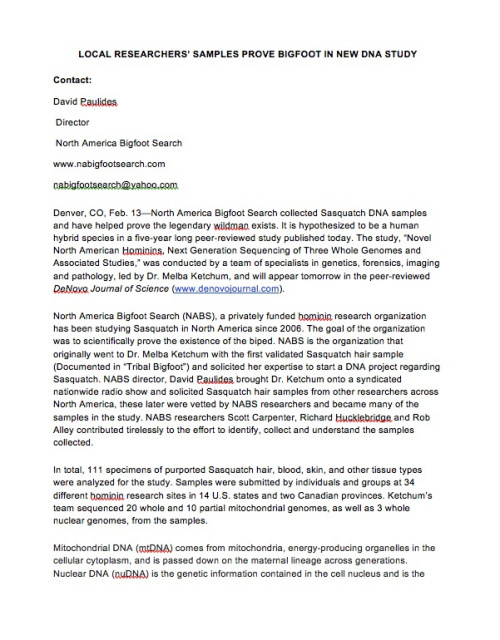 12/6-Just for clarity, Igor Bourtsev made a public statement this morning that the Bigfoot DNA Study is at a Russian Journal and presently under review, he expects news quickly. 11/9- Television station KTEN in OK televised this two part series about bigfoot in Honobia with a great interview with Charles Branson, a retired Ranger. 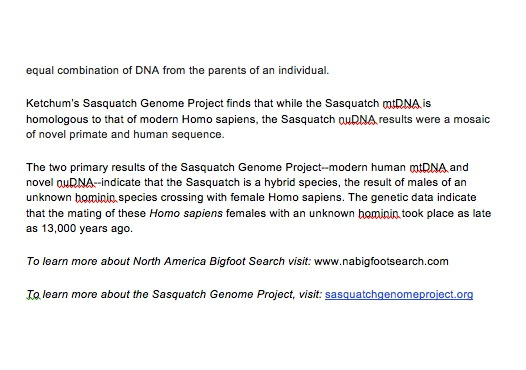 Welcome to the most professional Bigfoot research organization in the world. We are dedicated to investigating all aspects of the Bigfoot/Sasquatch/Wild Man phenomena. We are a group of seasoned researchers and investigators. We are committed to maintaining scientific principles in all aspects of our research. Our goal is to obtain the confidence of the local community, gather as many witness sightings as possible and couple that with extensive field work and technically oriented surveillance, evidence gathering and follow-up modeling. If you have information about Bigfoot/Sasquatch/Skunk Ape/Yeti in your area, we are interested in hearing directly from you. It's unimportant where in the North America your sighting occurred or if there were additional witnesses. It does matter if you took notes and preserved evidence immediately after your sighting. Attempt to document as much information as possible before it escapes your recollection. All information that you forward to the North America Bigfoot Search is held as confidential and we do not sell, forward or pass on any personal information that we receive through our website. 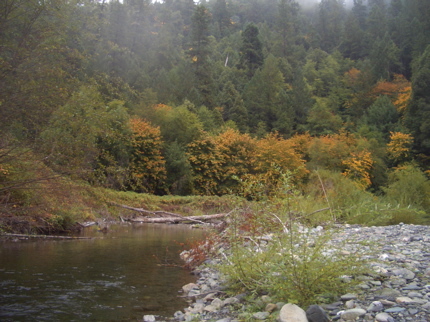 Our organization has professional researchers that have spent countless hours in the known Bigfoot hot spots of the world (Bluff Creek, Siskiyou County, Del Norte County, Skamania County, Humboldt County, Trinity County, regions of the Klamath and surrounding areas, Texas, Oklahoma, Minnesota, etc). How long do they stay in a community? How many full time researchers are on staff? How much do they have invested in technical equipment? Are they readily available and professional? Can they be on your site in a reasonable time period? Have they aligned themselves with academic professionals? Do they have the resources and full time staff to undertake a large investigation? Do people on their staff change sighting reports after they are submitted by a field researcher? The mission of the North America Bigfoot Search is to document the sightings,incidents, habitat, physical characteristics, migratory paths and other pertinent information of the biped we know as Bigfoot/Sasquatch/wild man. The accumulation of evidence and documentation will be accomplished through non-life threatening means and this information will be bound and presented to state/ federal legislators and made available to the public with the possible goal of authoring laws for the protection of the hominid and legal acknowledgement of its existence. **Thanks to Harvey Pratt for the outstanding sketch that appears at the top right of our website.